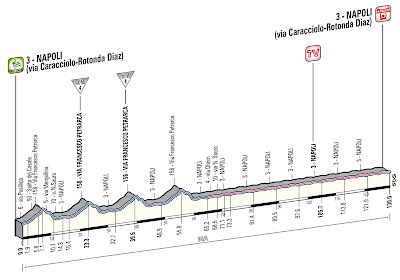 Stage 1, 130 km in Napoli. The stage is subdivided into two circuits. The first circuit is 16.4 km long and is ridden 4 times. It includes the climb up the collina di Posillipo (Eng. Posillipo Hill). The lower part of the climb is paved with basalt slabs, with asphalt on the upper slopes (where it is partially worn) and the descent. 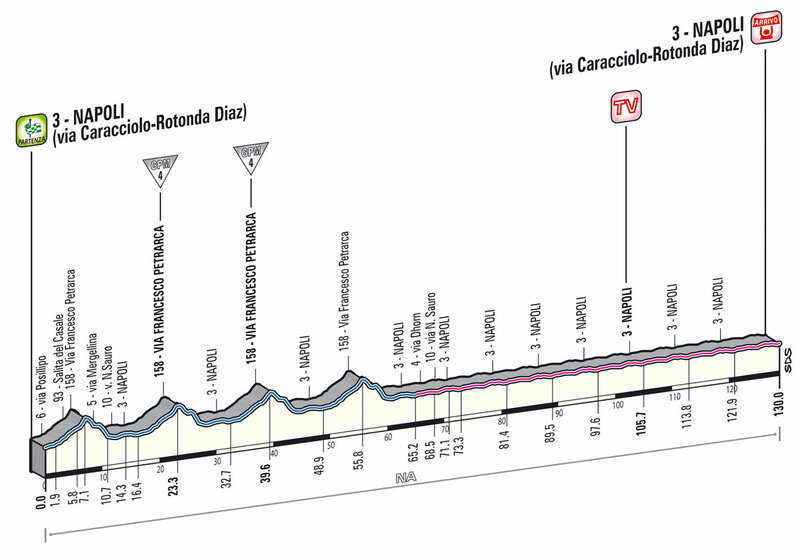 The climb at Posillipo has a Category 4 GPM on the second and third circuits. The second, shorter circuit is 8 km long and ridden 8 times. It is the same as the first circuit, but without the climb. In other words, it is perfectly flat. Both circuits are along broad avenues, surfaced mostly with asphalt, except for short stretches paved with basalt slabs or cobbled with sanpietrini bricks in good condition. The final kilometeres are along broad, flat avenues with some tramway crossings. The finish is on a straight avenue 950 m long and 8 m wide, surfaced with asphalt. The weather is clear skies, 25 degrees Celsius, rising later to 26 degrees Celsius. 207 riders of 31 different nationalities, representing 23 teams, will start the 130 km stage. Will Mark Cavendish don the first maglia rosa? 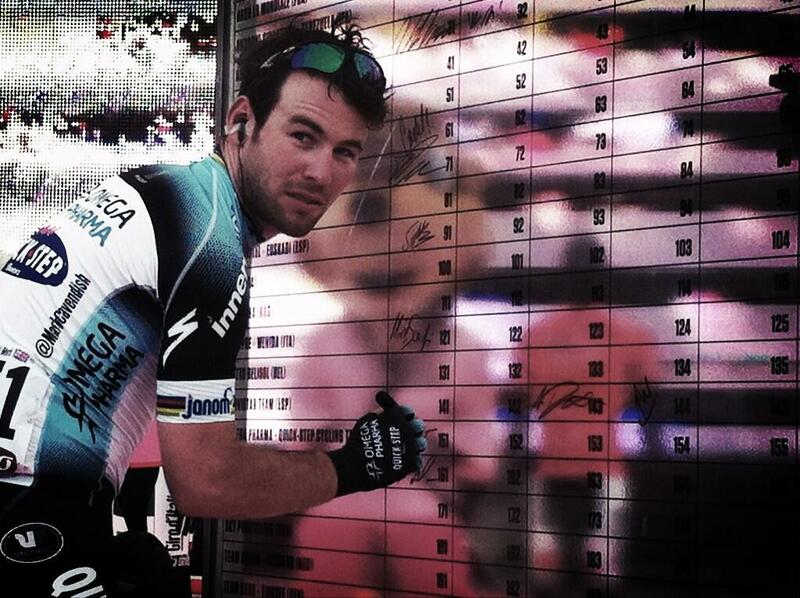 Or will it be Matthew Goss (Orica-GreenEDGE)? Or one of the Italians, Daniele Bennati (Saxo-Tinkoff), Sacha Modolo (Bardiani-CSF), Roberto Ferrari (Lampre-Merida),or Elia Viviani (Cannondale)? Stories for the Italian Cycling Journal about rides, granfondos, touring, having a good time cycling in Italy, Italian cycling history, racing, etc. are always welcome. Contact me at veronaman@gmail.com. There are now more than 2,800 stories in this blog. The search feature to the right works best for finding subjects in the blog. There is also a translate button at the bottom so you can translate each page.